Yesterday August 29th marked the Opening of the 2012 London Summer Paralympic Games. This is also Liberia’s FIRST appearance in a Summer Paralympic Game. You can watch the Ceremony by CLICKING HERE; Liberia enters at 1:32:49. James “Bobby the Big” Siaffa served as the Flag Bearer and will be making history as Liberia’s FIRST athlete to qualify to compete in a Summer Paralympic Game. Cheer him on as he represents Dear Liberia on Tuesday September 4th. ParalympicSports TV will be airing all competitions LIVE; CLICK HERE to watch. Below are more images from the Welcoming Ceremony, ENJOY!!! With LESS then 24 hours until the 2012 London Summer Paralympic Games begin, Liberia’s Paralympic Committee and athlete are welcomed into London’s Olympic Village. Today, Liberia and London exchanged gifts in honor of the 2012 Games. This is a BIG year for Liberia; Power Lifter, James Bobby “The Big” Siaffa, will be making HISTORY as the FIRST athlete to ever represent the country at a Paralympic Game. Siaffa entered the village with Coach Nagbe of Monrovia and Liberian Paralympic Committee Members. Bobby “The Big” is scheduled to compete on Tuesday September 4th in the Power Lifting Competition. 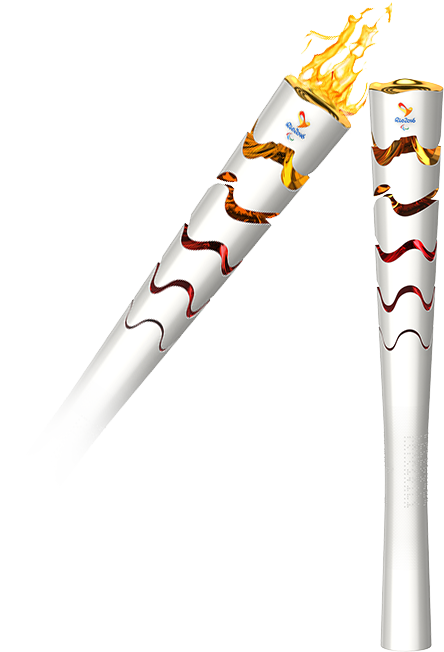 This leaves SEVEN days until Liberia makes its debut in the Paralympics. The Opening Ceremony of this year’s game begins tomorrow August 29th; wish our representative well as he makes history for Our Dear Nation. Feel free to revisit this page for images of the Welcoming Ceremony. Below are some photos of Bobby the Big and Committee Members. The flames of the 2012 London Summer Olympics have been extinguished and most of the participants have returned to their origins. However; the GAMES are NOT over yet! With only 2 weeks until the 2012 PARALYMPIC flames ignite, symbolizing the start of the 2012 Paralympic Games, let’s take a moment to welcome JAMES “BOBBY the BIG” SIAFFA to the World Stage. SIAFFA is a Liberian Powerlifter. He will be making History as the FIRST Liberian to compete in the Paralympics. The Paralympics is an international sports competition for extraordinary athletes with physical disabilities. The name “Para”lympic is used to express the game’s parallel format to the Olympics. Powerlifting is the ULTIMATE test of upper body strength, pushing athletes to lift over THREE times their bodyweight in some cases. SIAFFA’s recent lift of 170kg/374lbs, at the World Paralympics Powerlifting Championship in Malaysia, qualified him to represent Liberia in the 2012 London Games. As Siaffa prepares to make his dream a reality, let’s cheer him and Liberia on. You can leave a comment for Siaffa by Clicking Here. 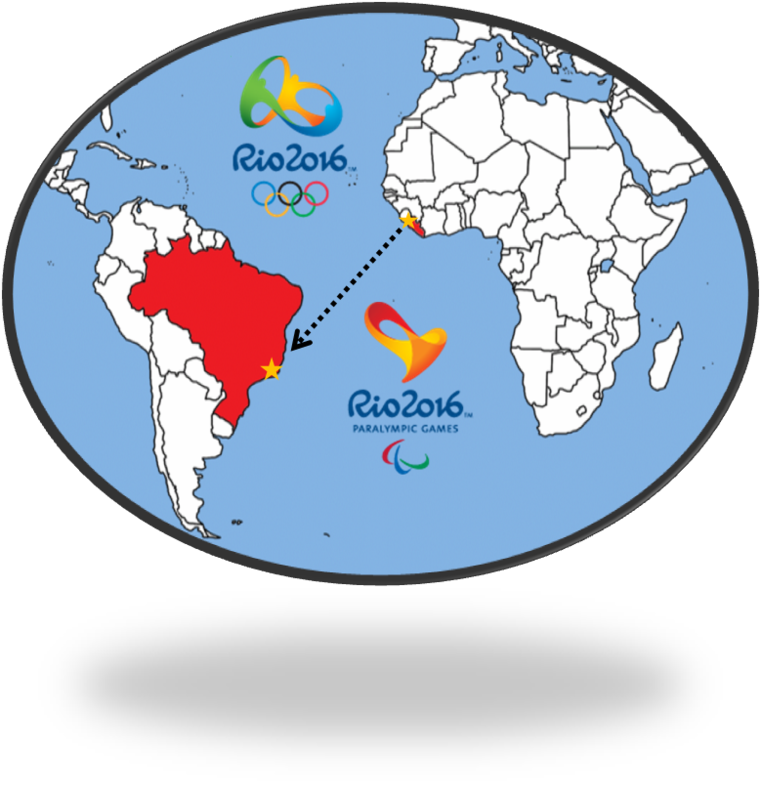 You can view the Paralympic Games from August 29th- September 9th by Clicking Here. In the mean time the site will be updated with more info and images on Liberia’s FIRST Paralympian James “Bobby the Big” Siaffa. 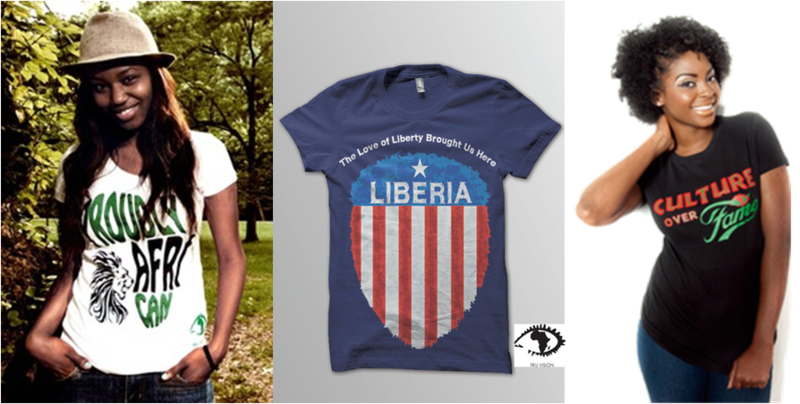 Liberia has completed its participation in the 2012 Summer Olympics and done well. As the London Olympic Games near an end, stay tuned for the Paralympic Games, which will begin August 29th and last until September 9th. 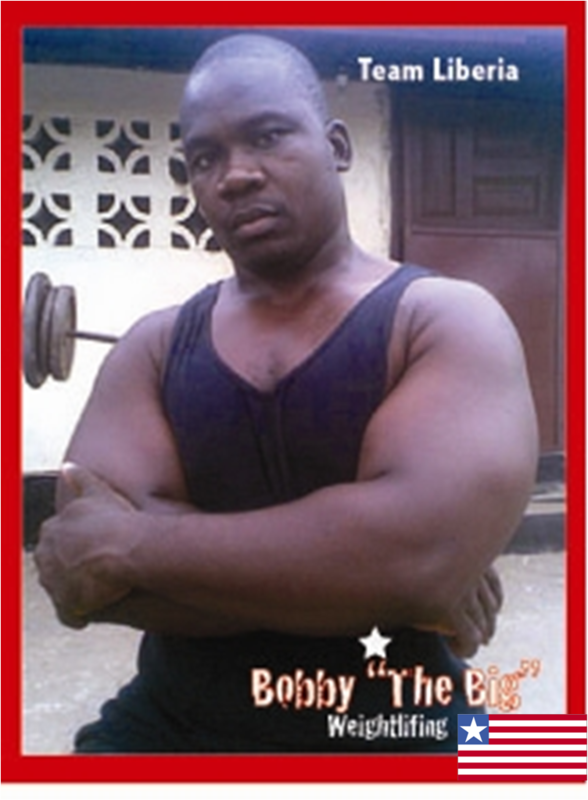 It’s been announced that Liberia is scheduled to have a Power Lifter represent the nation in this year’s Paralympics! 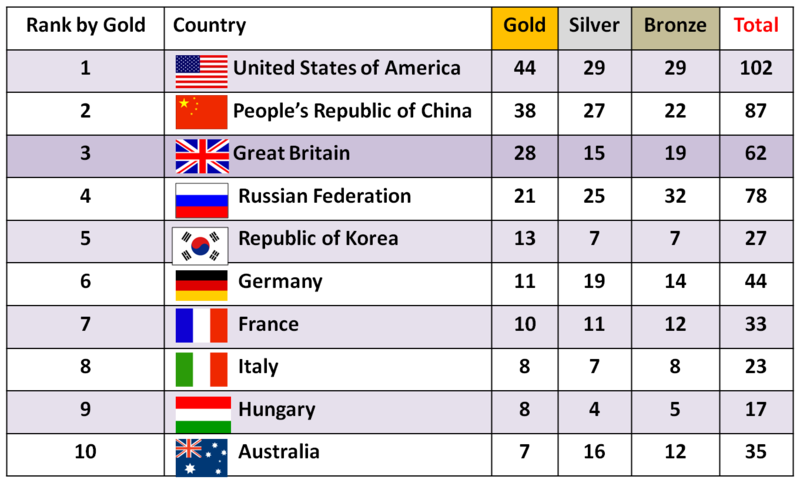 As we wait for the CLOSING CEREMONY of the Olympics and the OPENING of the Paralympics, let’s review the current TOP TEN medal countries. The Olympics is scheduled to end August 12th; the site will be updated with more information on our Liberian Paralympian as it becomes available. CLICK HERE for a FULL MEDAL COUNT. CLICK HERE for the Official Paralympic Webpage. For the pass 2 weeks, we’ve tirelessly watched our Liberian athletes represent Liberia in fierce competition. What might have taken us seconds or days to watch,has taken these athletes YEARS to prepare for. The road to the next Olympic Game starts HERE. The next four years will consist of practicing, training, competing, and qualifying; all in an effort to represent our Dear Liberia in 2016 and possibly bring her a medal. The journey to Rio begins NOW. May the 2012 Liberian Olympic Team inspire other Liberian athletes to begin their quest for the GOLD. May these future athletes receive support from family, friends, the Liberian government, businesses and fellow Liberians around the world. This is by no means an easy journey, but it is one that is possible (as these Olympians and the ones before them have proven). Congratulations 2012 Liberian Olympic Team on a job well done; best wishes to those beginning their journey to RIO DE JANEIRO, BRAZIL. 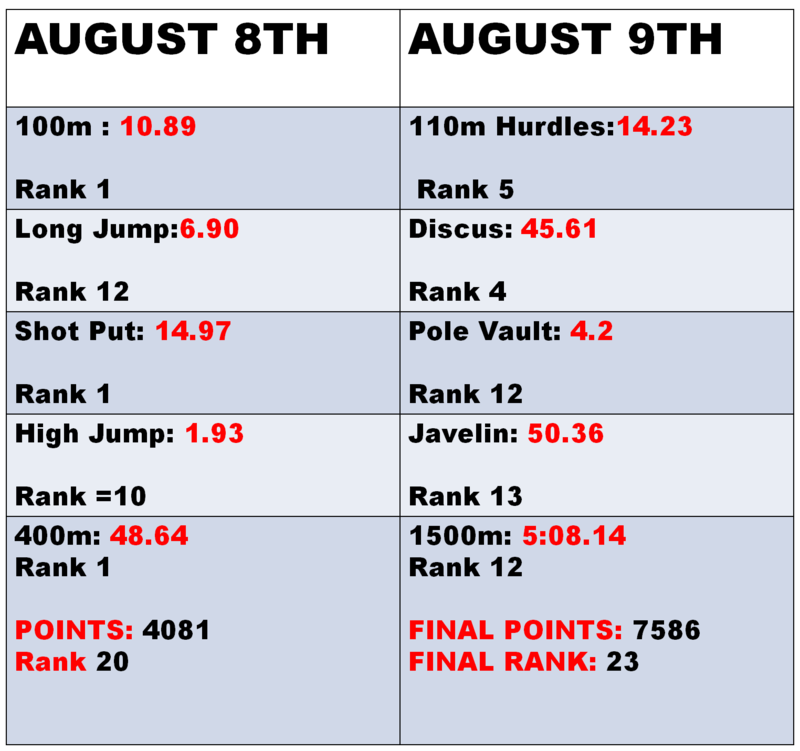 The final day of the 2012 London Olympic Decathlon is here; and the RESULTS ARE IN. Liberia finished 23 out of 32 competitors with a total of 7586 points. Addy gave a great performance, ranking high in the track events; and succesfully completing all TEN events. His efforts at this year’s Olympic Games are applauded, along with the efforts of each athlete who represented Liberia. This concludes Liberia’s athletic participation in the 2012 London Olympic Games. Thank you to the 2012 Liberian Olympic Team and all of the coaches/supporters who made the team possible. 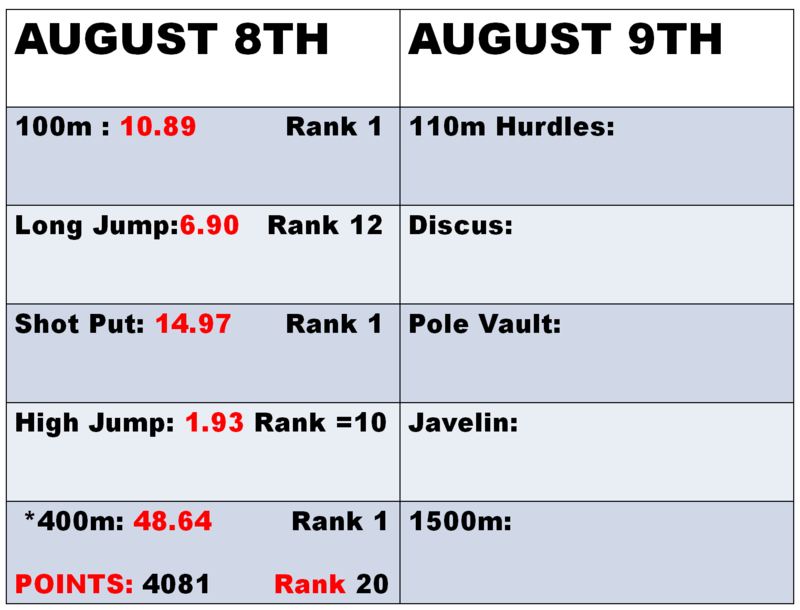 Specific results for Decathlon Day 2 are below. You can continue to visit the site for more tweets, exclusives, and possible interviews. Feel free to leave a comment to congratulate ALL of the athletes; and return for the final medal count and to view pics from the closing ceremony. With Day 1 of the 2012 London Olympic Decathlon event over, Liberia is ranked 20th out of 31 competitors. However, this is not the final ranking. Tomorrow will determine each countries ultimate ranking in the Decathlon at this years Olympic Games. Jangy Addy gave a stellar performance finishing FIRST in each heat that he raced in. You can view his Overall performance below (note: each rank represents his place in his competition heat or group). Stay tuned for part two. Tomorrow, Addy will attempt to improve his rank by competing in the 110m Hurdles, Javelin, Discus, Pole Vault and 1500m. 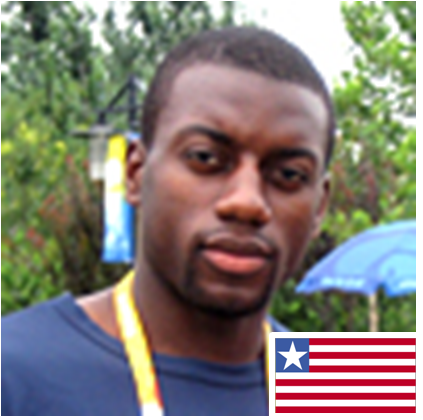 Wish him well and be sure to congratulate ALL of the athletes, who have represented Liberia at this years Olympic Games. Tru-Vision Wear is a clothing company whose motto, Risk & Conquer defines more than just their fashion designs. Risk can be defined as “taking difficult chances”; while to conquer is “to overcome”. 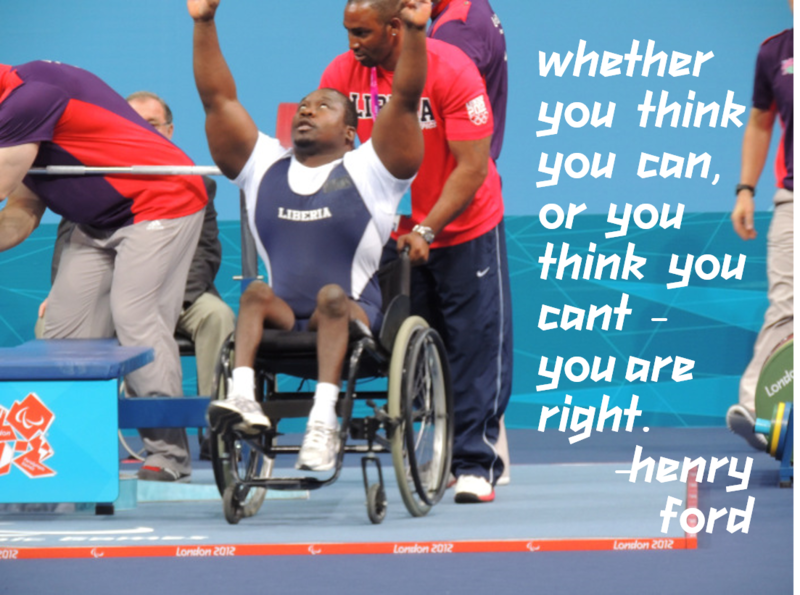 This motto nicely suites the 2012 Liberian Olympic Team, and ALL individuals who strive to do their best. Only by “taking difficult chances” can one truly “overcome” difficult situations. This year, the London Olympic Games opened with the theme Inspire A Generation. As the final competitors prepare to compete,during the last week of the 2012 London Olympic Games, I hope that each generation of Liberia, will be inspired to take reasonable risks in order to conquer all obstacles and achieve their goals. To visit Tru-Vision Wear Click Here. Tomorrow at 10am BST, Liberia’s final athlete, in the 2012 Summer Olympic Games, will take to the field. Jangy Addy will be competing in TEN events, over the period of TWO days. This young Liberian athlete has already obtained an international GOLD medal for Liberia during the 2011 All-Africa Games in Mozambique. 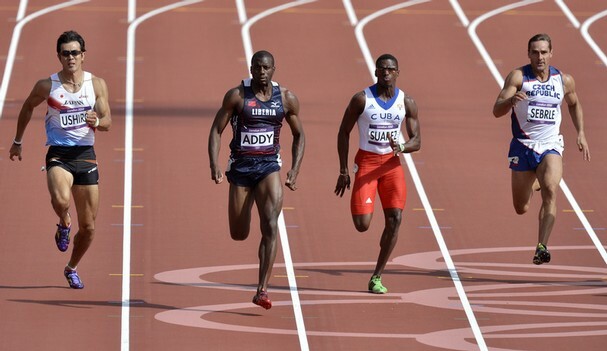 Addy has also represented Liberia at the previous Olympics in Beijing. On August 8th, Liberians around the world will be tuning in to Liberia’s final opportunity to acquire a 2012 Olympic medal. Regardless of what place Liberia takes in this event, we are proud to have qualified and we are proud of Jangy Addy for representing the nation. Visit his page on the site to wish him well. 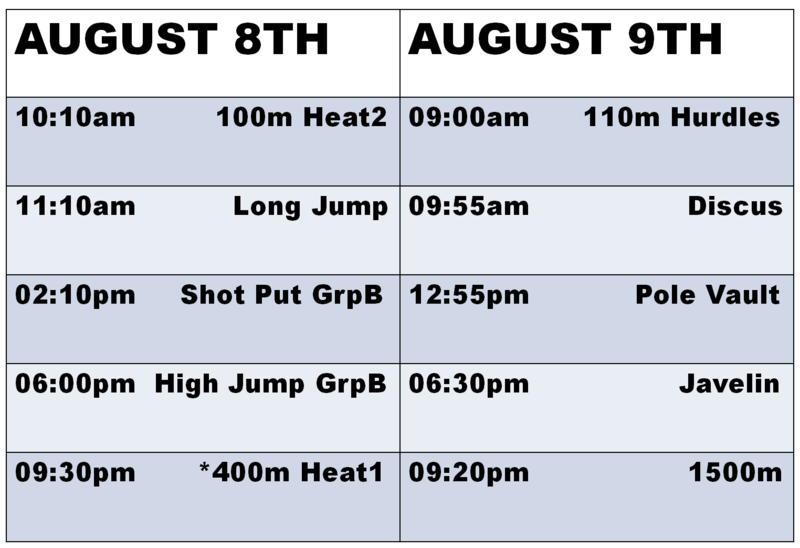 Below is his schedule; we will be updating his page with results as they become available. Just days after her race, Liberia’s Phobay Kutu-Akoi responds to some questions sent to her from this site. The questions and her answers are below. Enjoy and lookout for other possible interviews. 1.What has been your most memorable experience in London, so far? My Most memorable experiences in London so far have been walking out to the stadium to compete and also walking out during opening ceremony. 2.How does your Olympic Time compare to Your Personal Best? My personal best of 11.37 is faster than the time I ran at the Olympics, 11.52. 3. How’s the Liberian Olympic Team support & Dynamic? I love my teammates and everyone gets along well. We are supportive of each other and we all have the same vision and goal of getting our country forward athletically. 4.What will you be doing for the remainder of your time in London? I will spend a few days with my mother, support and cheer on my teammates, my training partners, watch some other athletes compete in different sports, go sightseeing and enjoy the closing ceremony. 5.How’s the Olympic Village & any shoutouts for your fans to add to the site? The Olympic Village is cool. There are a lot of choices of food and things to do. It can be compared to walking around a compound of super humans (lol that was only a joke) but I am enjoying my time here. Yes, a special shoutout to EVERYONE that has ever said a prayer for me, sent well wishes, posted on Facebook or twitter about team Liberia. I Love You guys. The support is amazing. Also to My family, my amazing friends, St. Johns U family, and the JfK high school family. 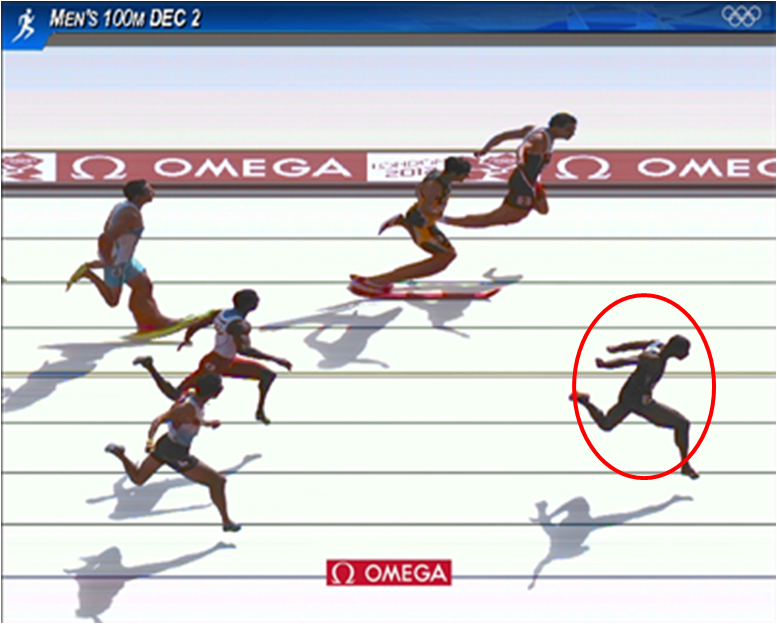 This concludes our interview with Liberia’s 100m athlete. Thanks Phobay for the interview and thanks for all of your efforts representing Our SWEET LIBERIA.